All Style Industries Storm Collars are fabricated in the USA from first quality, non-recycled E.P.D.M. rubber that is exceptionally resistant to heat, ozone and acid rain environments. No plastic resin materials are acceptable as any part of a Waterproof Storm Collar to assure long life that should exceed 20 years. Storm Collars are designed to waterproof single, or closely grouped multiple pipe roof penetrations. Choose the Storm Collar design that is pre-molded with the correct number of holes for the application being waterproofed. Waterproof Storm Collars are "Slide Over The Top" waterproof umbrellas. Disassembly of some penetrations may be necessary in order to install a Waterproof Storm Collar. All Style Industries Waterproof Storm collars are used to counter flash a Roof Jack Flashing that has been installed into a roofing system. Roof Jack Flashings are not included as part of the Storm Collar assembly. Storm Collar assemblies float above each corresponding roof jack and allow free movement or expansion of the penetrating pipes or pipes. At no time is the Storm Collar attached to the Flashing Jack assembly or is it ever attached to the roof membrane. No Sales Tax if Shipped outside of California! Order three hole collars when thermostate wires are inside liguid tight conduits. Order two hole when thermostate wires are exposed or if there are no thermostate wires. Call 702-570-5520 for more info. Large EPDM Rubber Storm Collars These parts are not available at this time. 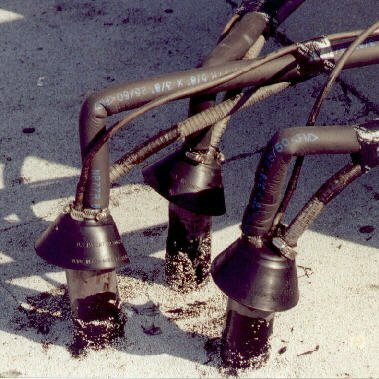 Profitable repair for broken vent and pipe flashings Use our single hole vent collars to repair seals on vent pipes. Now it's no problem waterproofing the "one size fits all" plumbing vent flashings that have silicone, neoprene or rubber tops that get cracked and worn out in the sun. Just slide on a storm collar and the job is done. Quick and easy! The shingles never get touched, removed or broken. 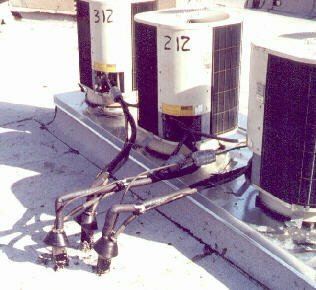 Just think how much profit can be made repairing vent pipe flashings that are cracked, broken and leaking on any structure. Since each of our storm collars are attached with marine grade stainless steel hose clamps, just bring a screw driver and leave the mastic at the shop. The best money making repairs provide a great solution for your customer and allow a good profit margin for your work. That is why EPDM storm collars should be part of your sales arsenal.